A raucous upbeat rendition of the Clement Clarke Moore poem telling the story of a visit from St. Nick as you've never heard it before. 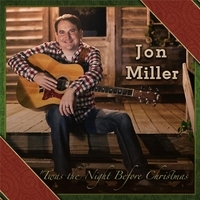 For over 15 years Jon Miller has been steadily promoting his unique style of upbeat country music on the Gulf Coast. Becoming more and more known, Jon has been an opening act for many nationally-known artists such as Trace Adkins, Charlie Daniels, and Josh Turner. Recently, Jon has been promoting his latest documentary film "Strung Together" about cigar box guitars taking his music and films around the country. He intends to keep pursuing his dreams, capturing audiences with his music and newly found film making career while building his growing fan base.